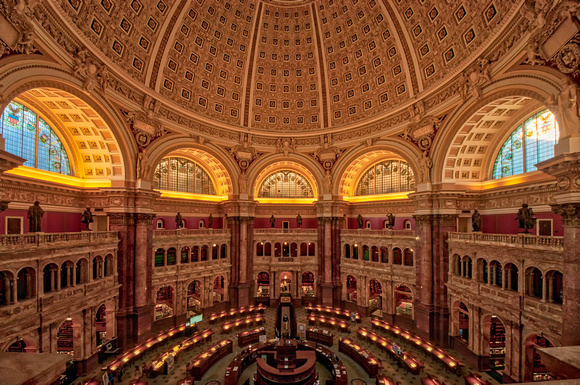 Twice each year, the Library of Congress opens its magnificent Main Reading Room to share information about how the public can access the Library’s resources year-round. The Main Reading Room will be open to the public on the federal Columbus Day holiday, Monday, Oct. 8, from 10 a.m. to 3 p.m. The Main Reading Room is located on the first floor of the Library’s Thomas Jefferson Building, 10 First Street S.E., Washington, D.C.
Reference librarians will be on hand to demonstrate services, offer instruction on obtaining a reader-registration card and answer questions. They will be available to demonstrate the Library’s online resources and discuss access to the Library’s vast on-site collections and electronic resources, including services and collections for use in family history research. No other reference services will be available, and all other Library of Congress reading rooms and buildings will be closed. Photography is allowed; however, visitors may not use selfie sticks, mono-, bi- or tripods. The Library’s Young Readers Center will be open from 10 a.m. to 3 p.m. with activity stations and programming for visitors. Young people under 16 must be accompanied by an adult at all times. Exhibition tours will be available to visitors on the second floor of the Thomas Jefferson Building. Send email to Michelle to let her know if you are going on this field trip.